In photographs of Utah’s Repertory Dance Theatre (RDT) taken in the 1970s Linda C. Smith is a slim, regal young woman, a bit sharp-angled reminiscent of Martha Graham, her long, dark hair ironed straight and parted down the middle in the fashion of the day. Her expression is soulful and serious but with a determined set to the jaw—she looks like the kind of person who might dedicate her life to Truth and Beauty, and as things turned out, that’s exactly what she did. 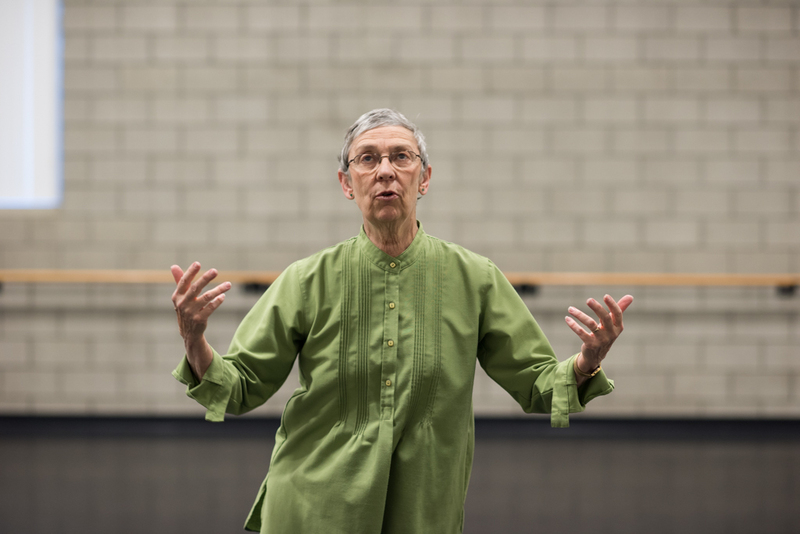 In 1966, Smith became one of the original eight founders of RDT, and 50 years later she is still with the company as Executive/Artistic Director. During those years Smith has guided the company through crisis and opportunity and achieved her dream to be a dancer, to work with the finest choreographers and to do it all right here in Utah. In 1965, I was standing in my kitchen in Detroit holding my 3-week-old son when I got a phone call. It was Dr. Gerald Freund from the Rockefeller Foundation inviting me to be a founding member of a new professional modern dance company. “I hope this isn’t some kind of a joke?” I said. The call was for real. Thanks to the persuasive efforts of Virginia Tanner, the Rockefeller Foundation was offering money to start a new kind of dance company—instead of concentrating on the work of a single choreographer this would be a democratic dance experiment with no star performers and no real leader; the company would learn and perform repertory from many different choreographers, commission new works and bring the art of modern dance into the dance-starved interior of the western United States (though a proposal to call the new company “Utah Repertory Dance Theatre” was nixed on the grounds that the word “Utah” implied Podunk origins). And so the Repertory Dance Theatre was born. AB: You knew you wanted to be a dancer all your life. Did you have a particular inspirational moment, something like Ruth St. Denis and the cigarette poster? LCS: I remember from age 4, I just connected with dance strongly. 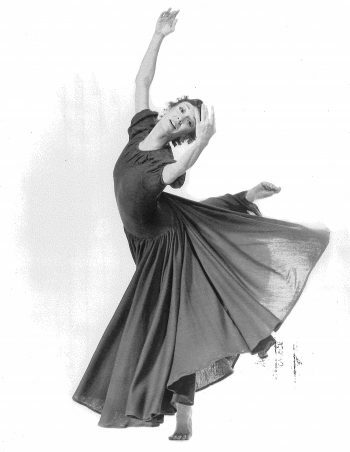 My mother read this article that Virginia Tanner was teaching creative dance— there were other dance schools but they were all what she called “Dolly Dinkle dance”—and I was just hooked. Miss Virginia opened my mind and my world and my vision. She didn’t teach me a dance. She helped me discover my own dance, one that was inside of me waiting to blossom. I remember at age 5 or 6 putting on the Victrola—Chopin was my favorite—and I would dance around wrapped in sheets like Ruth St. Denis. Well, I didn’t know who she was then, but I had lots of aha! moments for sure. I was always serious. A little too serious. As a teenager I would write my own poetry and then compose a dance to it. The Virginia Tanner studio was such an amazing place. You would meet the crème de la crème of the dance world. I remember meeting Ruth St. Denis at Virginia’s studio. My life was just wrapped around how I would continue in a career in dance. It was such a natural thing; it’s what I was born to do. My mother used to say, “What if I had never taken you to dance, what would you have done?” I suppose I would have become a rock, or vanilla pudding. I can’t imagine this world without seeing it through the eyes of a dancer. Virginia had you looking through the eyes of seashells, or flowers. Wherever I looked I was looking for a dance. AB: Back in 1966 you were the young whippersnapper and now you’re the Grande Dame. Did you have something of the Grande Dame in you all along? LCS: I still think of myself as 23. When I joined RDT that was a magical moment. That opportunity was handed to me—I won’t say it was a gift, I worked hard, but I tell you that was a golden moment. I was in the right place at the right time. It was an opportunity but a big responsibility too. Those eight dancers that were hand picked, we didn’t want to fail. The world was watching, we wanted to be a success and prove we were worth it, dancers out here in Utah. I’m of a generation where I remember working with people like Helen Tamiris, and she’s gone now. I feel like a connecting thread from the past to the present. I had the opportunity to build the early historical repertory. I discovered the classic dances were being lost and forgotten and I felt like I had to do something. I kind of slipped into a different role. I didn’t walk in knowing how to run a company so I took the skills I had and learned on the job. You’re not taught at university how to run a dance company and if you were you’d probably run in fear. This company has been a laboratory to experiment and try new things. That’s what Virginia and my mother taught me; you open the refrigerator, see what’s there and make a meal out of it. Creativity! That’s where it’s at. What an amazing blessing. AB: When RDT was founded it was important to the funders that it was in Utah. How has that relationship to place played out over the years? LCS: The Rockefeller Foundation had been giving seed money around the country to help decentralize the arts. They had in mind giving money outside metropolitan areas to nurture professional dance. They did a lot of research and they thought that dance had “fertile ground” in Utah. We just roared at that, we thought it was so funny, but you know Brigham Young built a theater before he built the temple. It’s just a place where dance is one of the greatest resources. We still look at dancers trained in Utah first. LCS: We don’t do it any more because it takes 12 slide projectors and where would you get them? It really was a piece of its time. It was a dazzler. It was a light-show dance and it was pretty innovative. People still talk about it and say why don’t you bring “Diamond” back, but you know, some pieces have a shelf life. AB: I was poking around in the University of Utah library archives and found an RDT program from 1968 and realized that I went to that concert when I was 7 years old. I think seeing performances like that as a kid is why I write about dance nowadays. LCS: You need to put that in the article. We did a lot of arts education even back then. There is a loyal audience that remembers the 1970s and they invariably say, “You made such a difference when I was in college.” It connected with a whole generation of people. My point is, we have an audience that’s been with us all 50 years and that thrills me. I think we made a difference; we made an impression on people. At least I hope so. AB: You’ve been the sole artistic director of RDT since 1983. Does the original democratic spirit of the original RDT live on? LCS: The company is not my company. The mission is at the center of everything. So it was a consensus after the first 10 years that we would be smart to have some people a little more equal. The Rockefeller Foundation had it in mind that the company would find a way to govern themselves based on the mission and leadership would come from within. It’s still like that with Nick [Cendese] and Lynne [Larson]. If you don’t have the dancers behind you, you can’t be a success, so it’s a representative democracy. AB: What’s your plan for the next 50 years? Are you planning to retire? LCS: I don’t like that “R” word. I’ve got a list of projects, like everyone asks, when are you going to write your book? My mother lived to be 105. There are some good genes there. I want the company to survive. I think it’s an important and a valuable institution in Utah. Maybe my job description will change, but for the anniversary year, I just want to enjoy the good will and congratulations. It’s a fun year. There are some bright young creative people coming up. The dance world—some parts of it are really changing. I think it’s important that the voices of today, the younger voices, need to be heard. I’m a facilitator, I’m a producer, I’m a dreamer, to call myself a visionary seems a little highfalutin. I’m part of the team. The company won’t go away if I go away. It should live on and on. AB: Anything else you’d like to say? LCS: I’m just so proud of the company and I’m proud that we have been able to keep it alive and well for 50 years. The people that you meet! 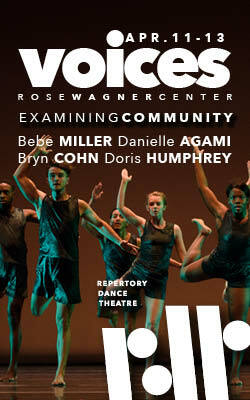 To be able to work with brilliant choreographers, composers, staff members—it’s quite a cruise ship. It’s been an honor working with the people. I’ve loved rdt from the beginning. Splendid article. Thanks. What a deep and delightful interview with the equally deep and delightful Linda C. Smith. I, too, am a fan of RDT dating back to my college days — all too long ago. Loved the part about looking in the fridge, seeing what’s there, and making a meal out of it, a lesson learned from Linda’s mother and Miss Virginia (Tanner), then applied, I am sure, to her dance company. GREAT stuff. Thanks so much, Amy Brunvand, for asking ALL the right questions and digging out the good stuff.